A super solution to colourful ground-cover. There are few plants easier to grow than Sedums - even the most novice gardener can get results. This gorgeous collection of low-growing, reliable succulents make an ideal choice for rockery planting, containers and borders. Lovely evergreen foliage in a mixture of colours is topped by a haze of pretty sprays of star-shaped flowers in summer. Stonecrops will spread to around 25-60cm and further and are supplied as a collection of 12 established plug plants (2 of each variety) ready for potting up. There are few plants easier to grow than Sedums - even the most novice gardener can get results. This gorgeous collection of low-growing, reliable succulents make an ideal choice for rockery planting, containers and borders., forming a carpet of colour. 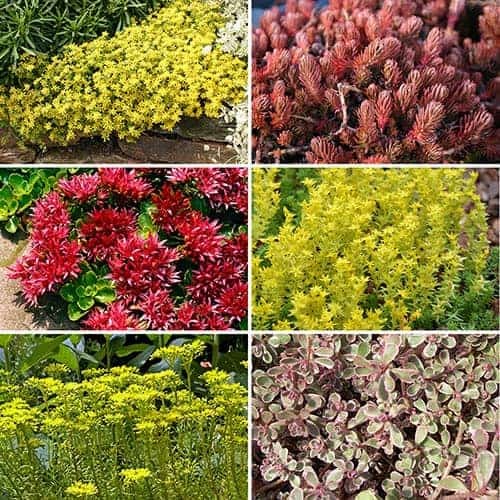 This mix of 6 perennial sedums has lovely evergreen foliage in a mixture of colours and as ground-cover plants they will grow almost anywhere - even between cracks in the pavement - and are tolerant of dry conditions. Through much of the year, the stems are short, semi-prostrate and densely clad in leaves. Then in the summer, the stems lengthen and grow more vertical, before producing a haze of pretty sprays of star-shaped flowers. During the winter or in times of drought, when other plants are fading, these plants will colour up even more, with their leaves turning bronze-red. Quickly covering bare patches in a border, stonecrops will spread to around 25-30cm and further, as each leaflet has the potential to make a new plant. Supplied as a collection of 12 established plug plants* in 6 labelled varieties for potting up. 2 of each variety. *Please note that varieties may change depending on sesonal availability. Use this lovely little plant to fill in gaps wherever they appear. To propagate, simply break off a piece and stick it in the ground - it's that easy! There are few plants easier to grow than Sedums - even the most novice gardener can excel at growing them. All you need to remember when growing Sedums is that less is more...They need no additional water or fertilizer - in fact overwatering and overfertilizing can do more damage than good. They will thrive in most conditions apart from very wet, waterlogged areas. Ideal to plant where there is too much sun or too little water to grow anything else. A common name for Sedum is Stonecrop, due to them being able to survive between stones!